Oh my god – we’re at the end. The very end. Wear again? 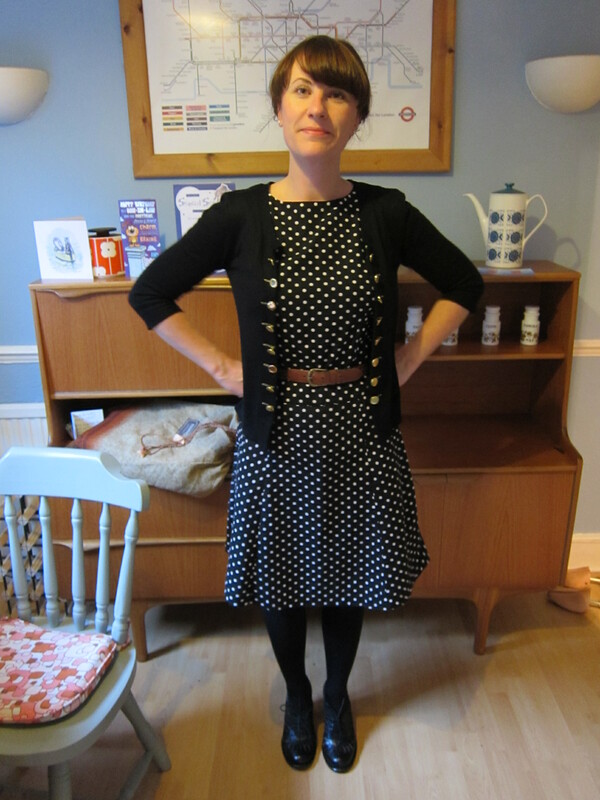 Oh I don’t think so, due to complete and utter lack of dressmaking skills when I made it. There are no darts; it was basically a dress outline cut out and sewn together. With a peter pan collar thrown in for good measure. I think maybe it could be saved if I add some darts so watch this space. I do like the sixties kitchen sink vibe though. Get down t’factory Vera and knock us up a gusset! Wear again? Yay am happy to be wearing the beignet once again before the month is out. Perfect for a hot day in London Town. Day thirty: Final day outfit!!!!!!!! Wear again? 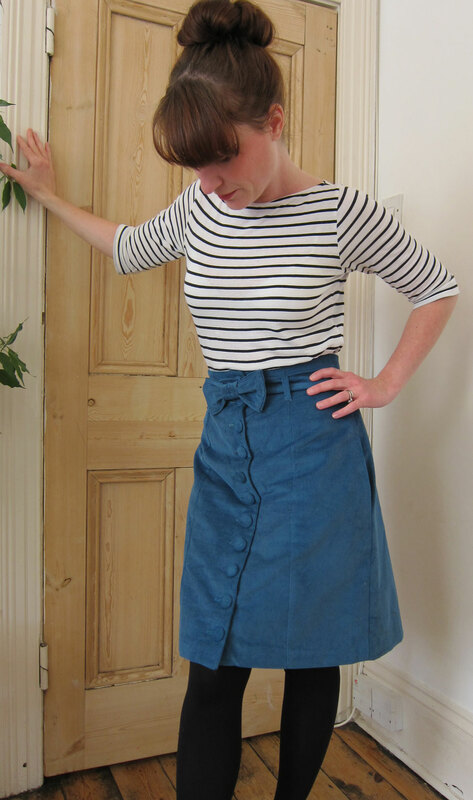 Awh I feel a bit of a cheat since I’m not wearing a full made-from-scratch outfit but it was so HOT and most of my other stuff is fairly robust and not at all suitable for summer. Note I am not wearing tights in this pic – they are footless tights which are much cooler and remove the need to de-hair and tan, so there. That’s it then. All done. I’ve been penning a bit of a review of the month so far so will pop that up over the weekend. But for now it’s goodbye Self-Stitched-September, thank you Zoe and good night! 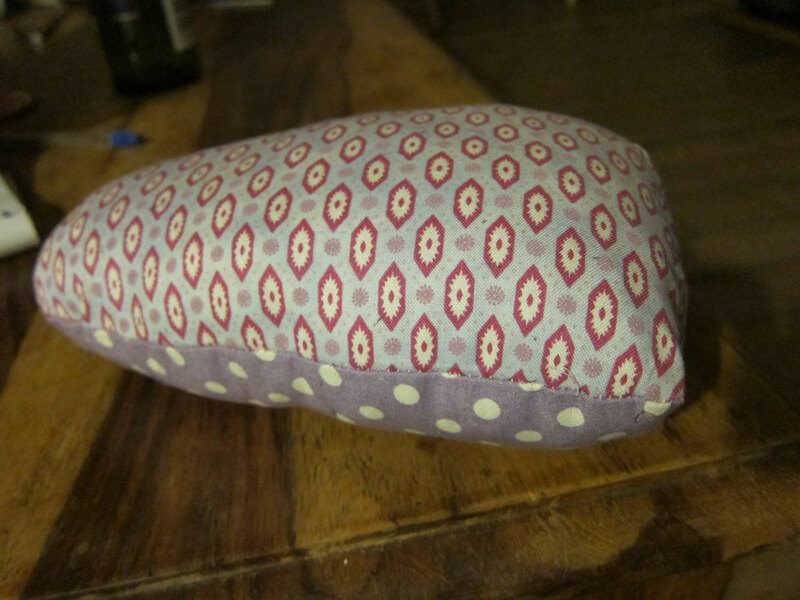 Sick of pressing dodgy darts and crazy curved seams on my old worn out ironing board, I decided last week to investigate buying a tailor’s ham and perhaps even a seam roll. A quick search on google shopping threw up a rather interesting tartan version for under a tenner (not for me). Undaunted I turned to Etsy for something cute and unique. Yeh… you can get them there… but it’s more like £20. For a bit of stuffed fabric? Really? So I decided to investigate making my own, using fabric from my bulging scraps bag lurking in the corner of the sewing room. I found a fantastically easy tutorial (including a pattern to print out) from http://www.bombardone.com. I had no idea it would be so deliciously simple! They also give instructions on making your own seam roll which I’ll attempt next week. 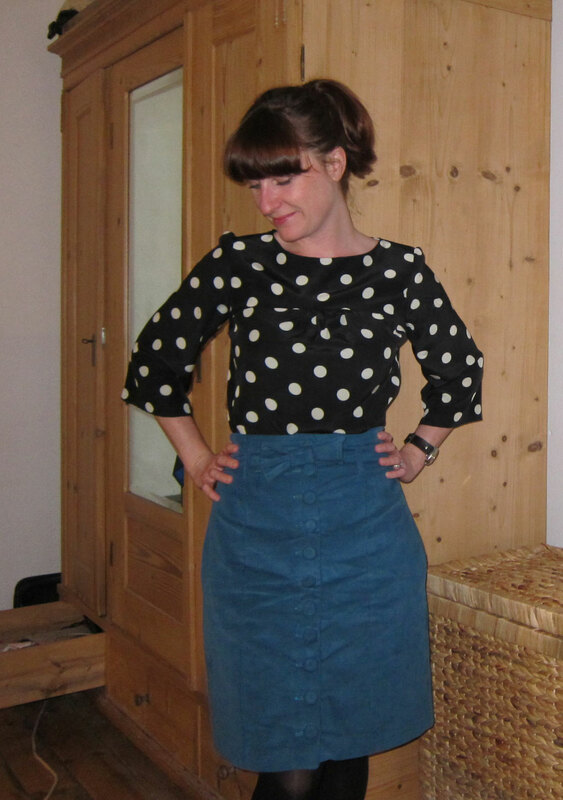 Plus this tute from Burda Style also goes through it very well. So first you cut out four layers of your chosen material, all to the same pattern shape. I chose contrasting fabrics for my top and bottom. 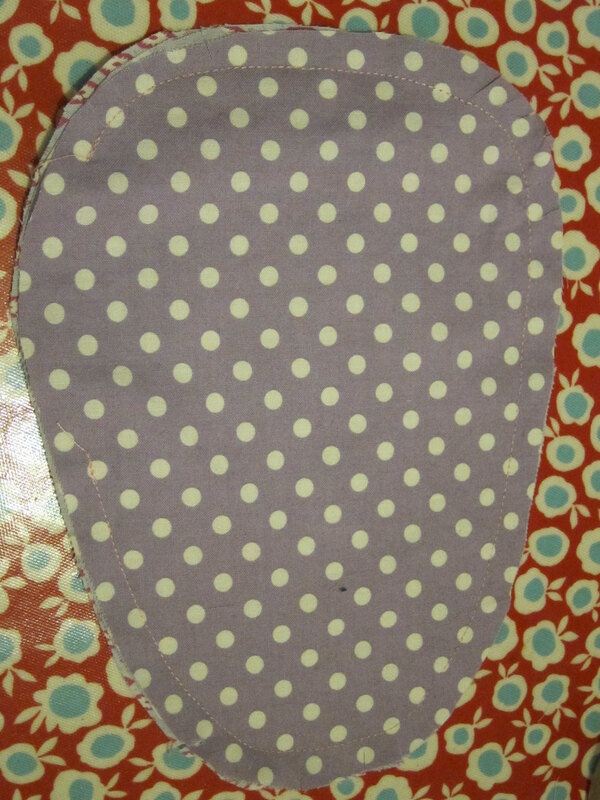 I had some leftover fat quarters from napkin making. When I say ‘leftover’ I mean I got bored of making napkins, which mans we have three napkins at home. Handy for dinner parties eh? 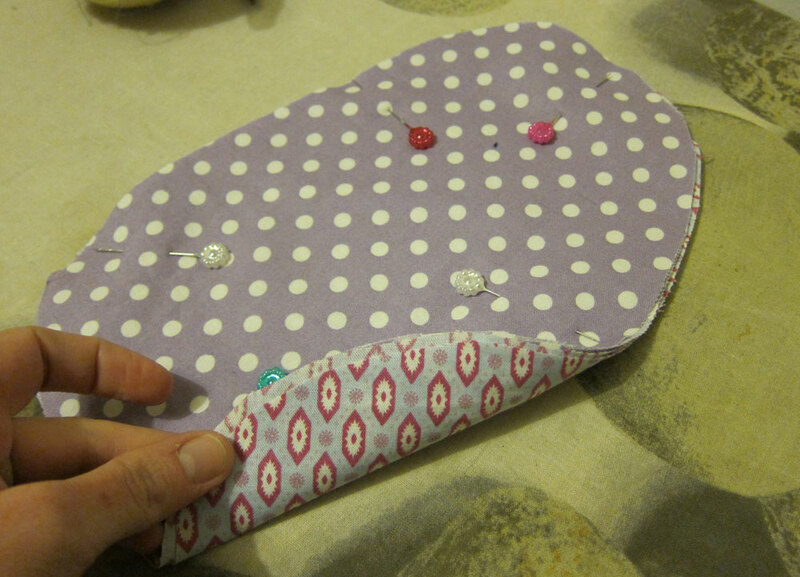 You pin all four layers together with the innermost two layers right sides together. When you turn this right side out later on it’ll make sense. The other two layers on the outside of your project don’t really matter as they’ll be on the inside of your finished project, but I kept them right sides outward facing. Sew about a half inch seam allowance all round the edges, leaving about three inches open (so you can stuff it with all those leftover fabric scraps). Turn it right side out. Then stuff it, stuff it and stuff it some more. 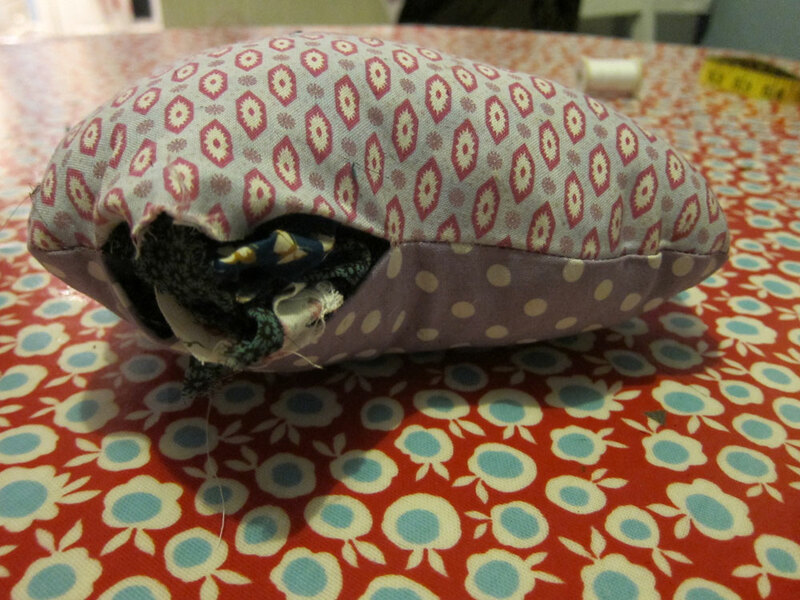 This bit took about ten minutes – it’s amazing how much you can get in there.This thing eats fabric scraps. Then just sew up the flap you left open and voila! A tailor’s ham that looks like it could have come from Etsy but cost pretty much nuffink to make. Bargainous, non? Wear again? Considering I’ve worn this at least six times already, yes. Oh yes. Wear again? Yep – love this top. I only look slightly embarrassed because I’m posing in public which always feels weird unless you’re a tourist. Day twenty-four: Confession: I took a trip to Norwich to see the in-laws and had such a busy day on Saturday I clean forgot to take any pics. 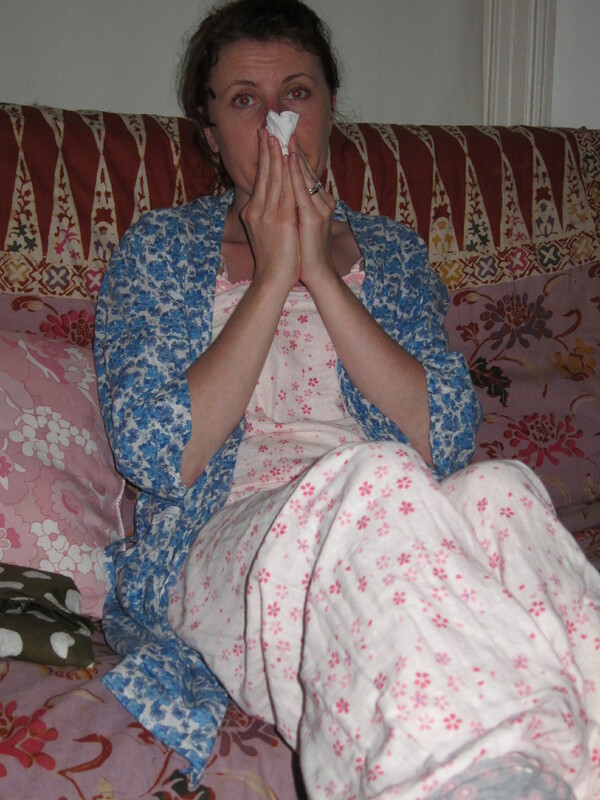 I promise you I was wearing the upcycled Monsoon dress – honestly. Day twenty-five: Oops – I never packed a second SSS’11 item for Sunday but I was wearing my robot bag all day so does that count? Wear again? 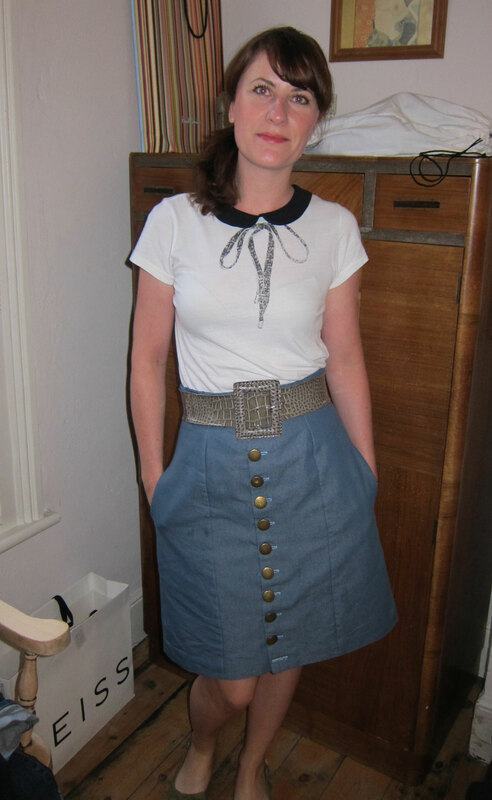 I swapped the belt I made for the Beignet out for a skinny belt which I hope refreshes it a bit. Wear again? 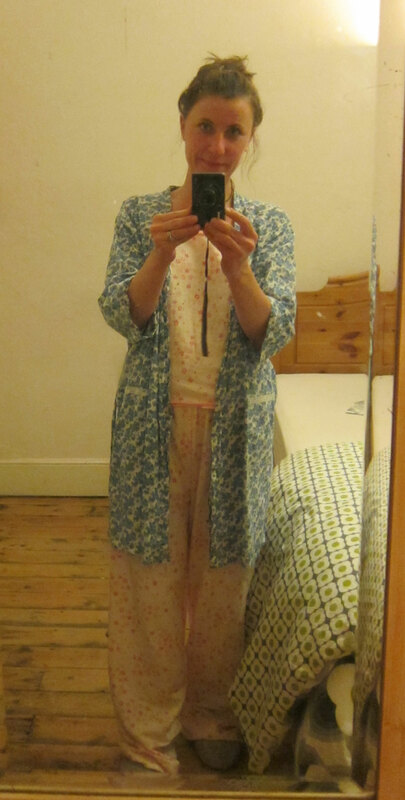 Ooh yes – these jammies are cosy, comfy and although they don’t take a stinking headcold and hacking cough away, they make me feel a wee bit better. Achoooooo! This weekend the husband and I took the train to Norwich for some quality time with the in-laws. After a lovely Saturday afternoon spent celebrating my 16-year-old sister-in-law’s birthday we did a quick spot of shopping around the The Lanes, a fantastic area full of little alleyways bursting with independent shops and vintage treasures. Although pre-payday my budget didn’t extend to buying vintage clothes, a second day exploring Magdalene Street on Sunday unearthed more affordable treasures. Magdalene Street is a vintage-loving sewist’s dream. It has no less than four (yes, FOUR!) fabric shops, a bunch of great charity shops stocking fabric, curtains, furniture and clothes plus a couple of amazing antique shops. One particular place was as big as a warehouse and was stocked to the rafters with stunning pieces of furniture. Not rock bottom prices but cheaper than anything I’ve seen in London and generally in much better condition for the money. It also had rails and rails of vintage clothes, aprons and textiles. Heaven! One day I will go back with a car and furnish my entire home from there, but in the meantime I picked up some vintage sewing supplies that I just can’t wait to use. 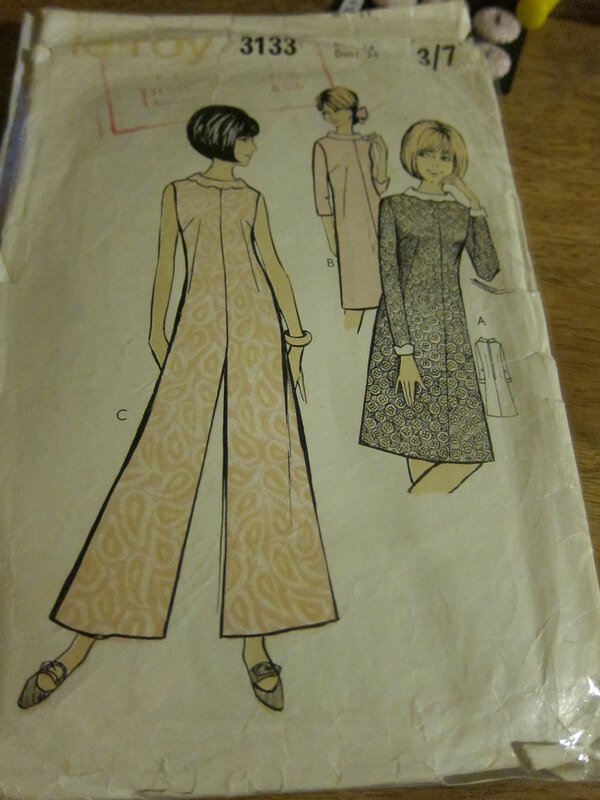 Love this little pattern from the 60s – specifically view A with the contrast collar and cuffs. However, after closer inspection I’ve discovered it’s unprinted! Ack. Not sure how to approach this. I know Gertie has done a tute on how to make a muslin from an unprinted vintage pattern but I suspect that one’s better left to a winter’s Sunday afternoon. 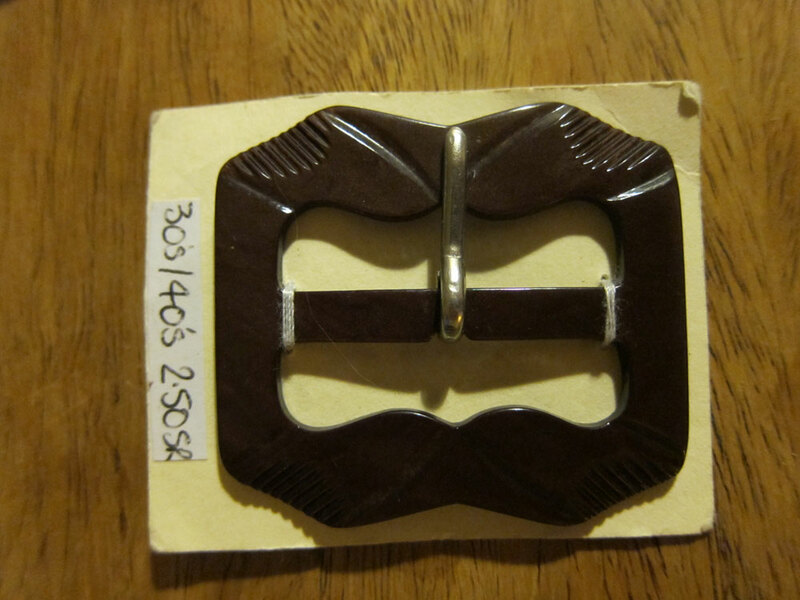 I also picked up a selection of vintage buckles from as far back as the 1930s. 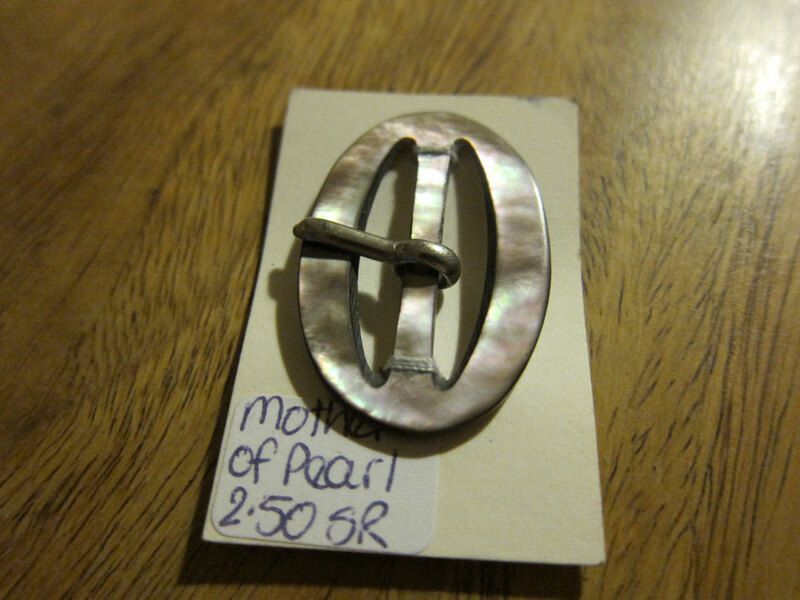 I particularly like the mother-of-pearl buckle – think that might make a nice belt to go with the Betty Blue Beignet. Look at these little sweeties – don’t they look good enough to eat? 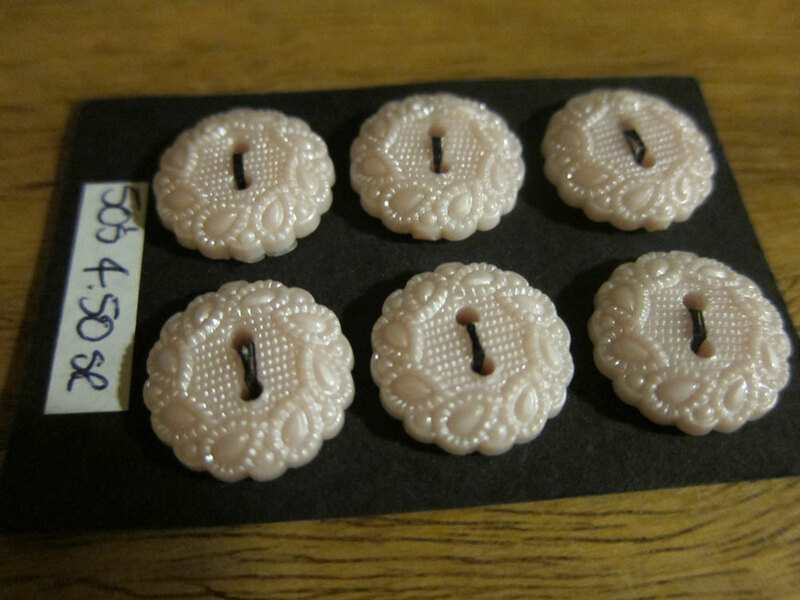 Looking forward to putting them on a vintage-style blouse or shift at some point in the future. 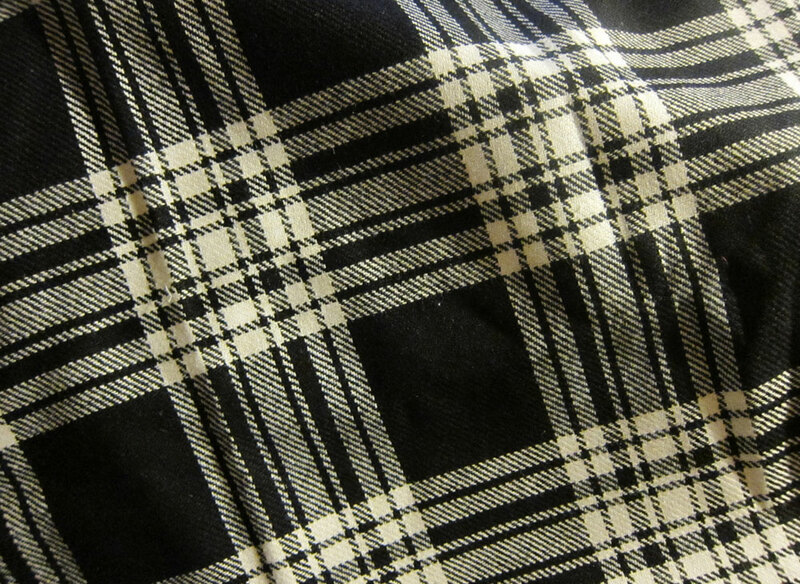 I also had a bit of a root through Oxfam’s fabric section and found this black and white check for £2. 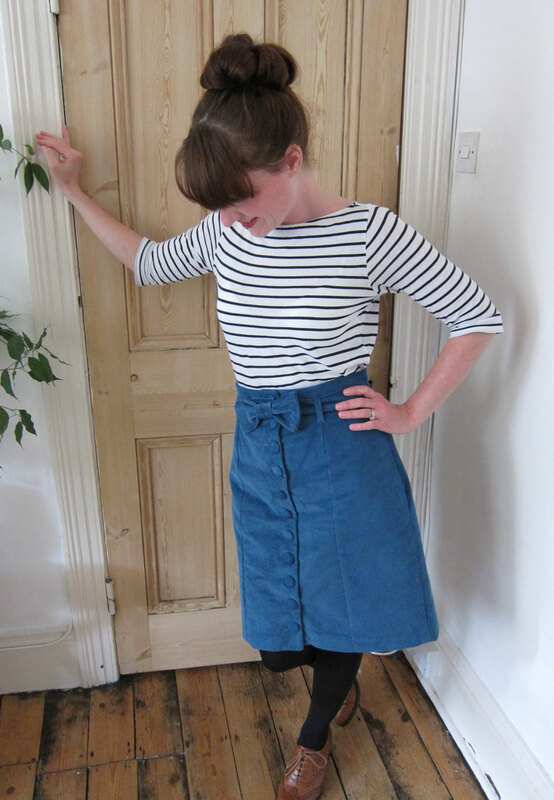 Possibly enough for a simple shift/pinafore? Definitely enough for a miniskirt. Not fantastic quality but am sure it will come in handy. 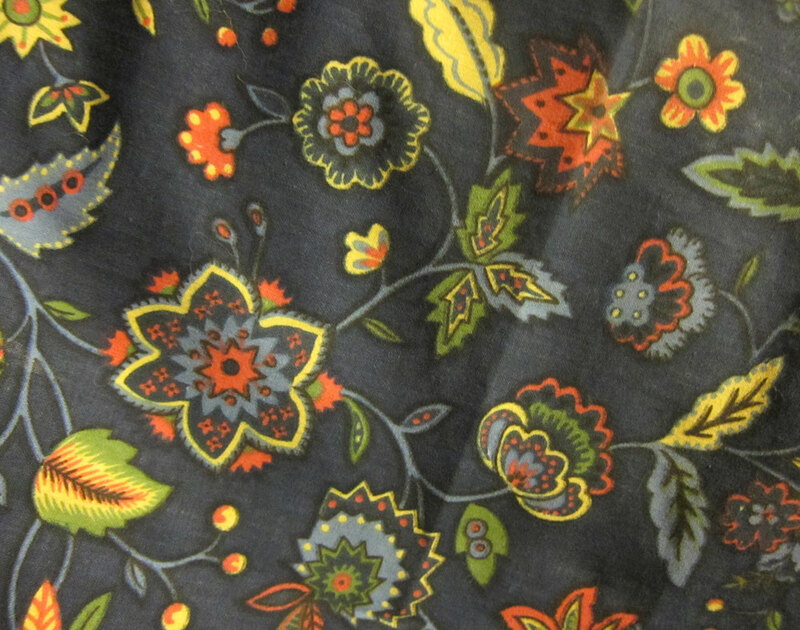 And far from Norn Iron I found this lovely cotton/polyester mix from none other than the Ulster Weavers for £5! I love the bright colours – it’s almost verging on arts and crafts territory. I’m going to use it as a throw as the fabric is rather too thick for clothes. Or perhaps it would make some gorgeous cushions with a lime green trim? The background blue is a lot more vibrant than this picture suggests btw. We’re on the home straight now. Only nine days of SSS’11 to go. Without going into too much detail (I’ll do a full review on how I’ve found my first self-stitched month to be at the end) this has been such an experience for me. I’m sure I’ve broken a few psychological barriers in how I dress for myself on a daily basis, although it’s also highlighted for me how much I’m still constrained by my own notions of dressing, mostly so as not to attract attention to myself. More on that later! 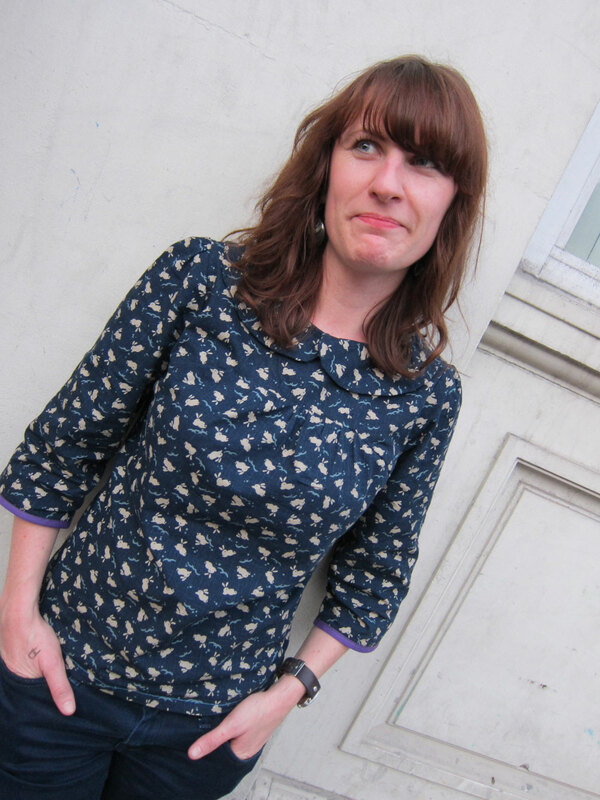 Wearing: Bright eyes smock top and a faraway look in my eye from all that meat. Wear again? Indeed – it allows you to eat half a pig plus potatoes and veg and still hides most of it convincingly. 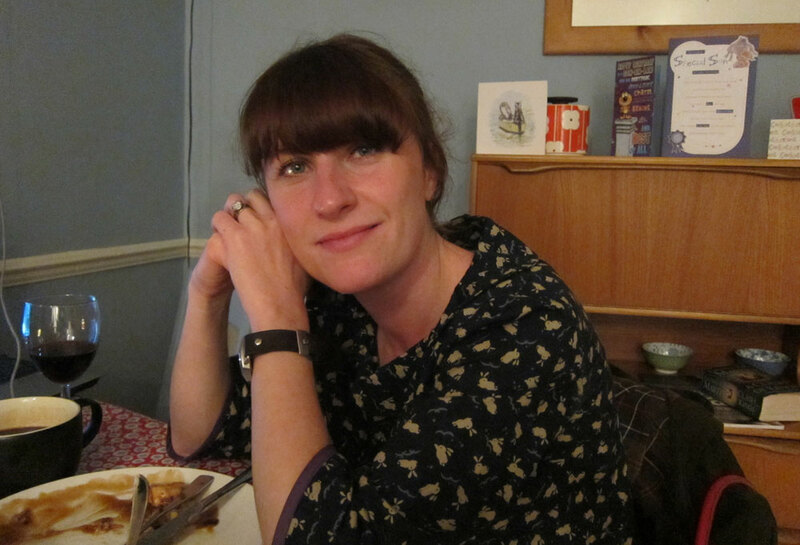 Don’t like that pic though – have developed a wonky fringe and a fat face – ah that’s where the piggy went. Fail pic, for shame. 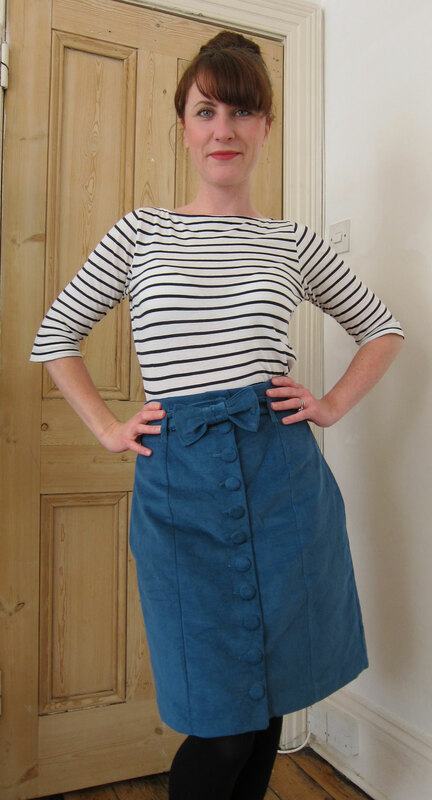 Wearing: Brand new, never-seen-before-only-just-finished Betty Blue Beignet, plus my favourite stripey top from Cos (complete with umpteen tiny holes, some of which are fixed some of which aren’t). Wear again? 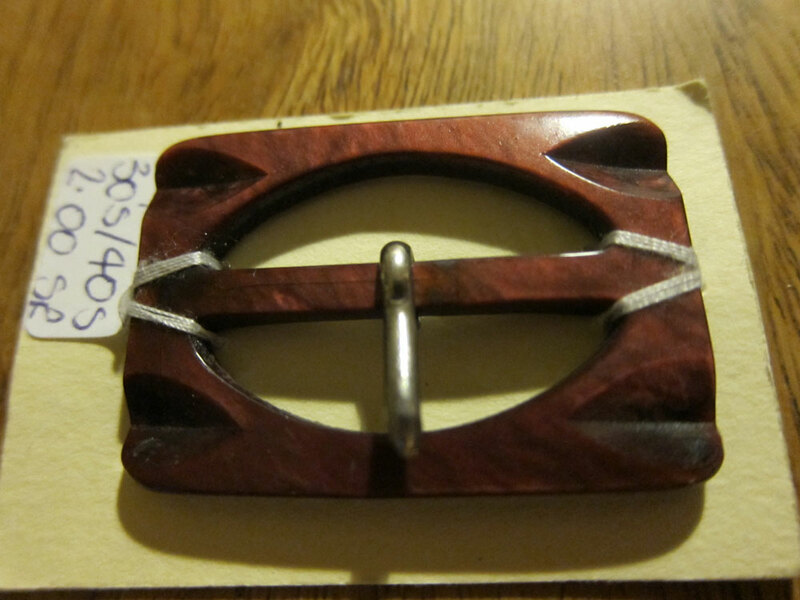 Of course – will try to mix it up a bit with different belts and tops to see how it looks. Looking forward to wearing it with a black ribbed polo neck when Autumn really sets in. Wear again? 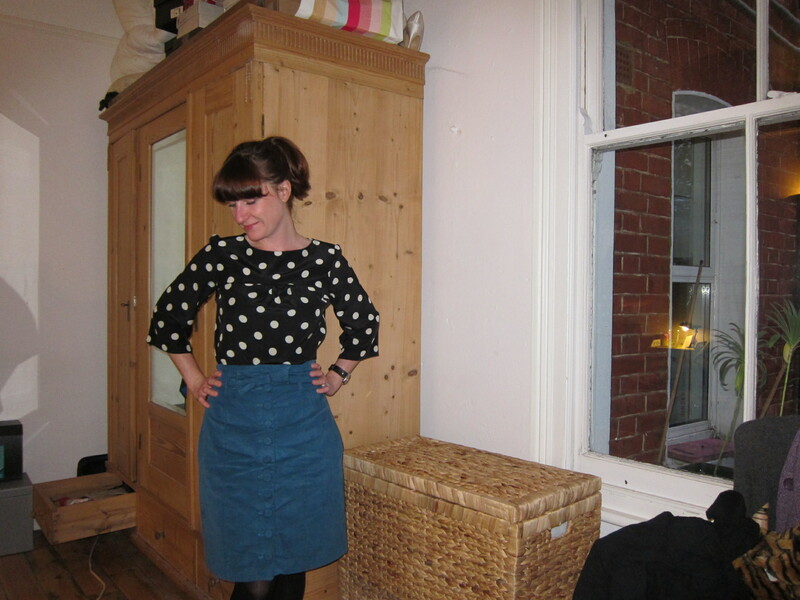 I couldn’t resist not wearing my new skirt a second day – it’s so cheery! Wear again? No. I really don’t like this top. The darts are wonky, the bias binding is too thick for the blouse fabric and it’s just… meh. I feel all drained and grey just looking at myself in it. Plus I’m not a big fan of the Sorbetto top in general – the shape doesn’t suit me at all, although I have seen some beautiful versions across other blogs. Not for me. One for the charity shop bag methinks. Wear again? I’m so pleased I tried this one today. 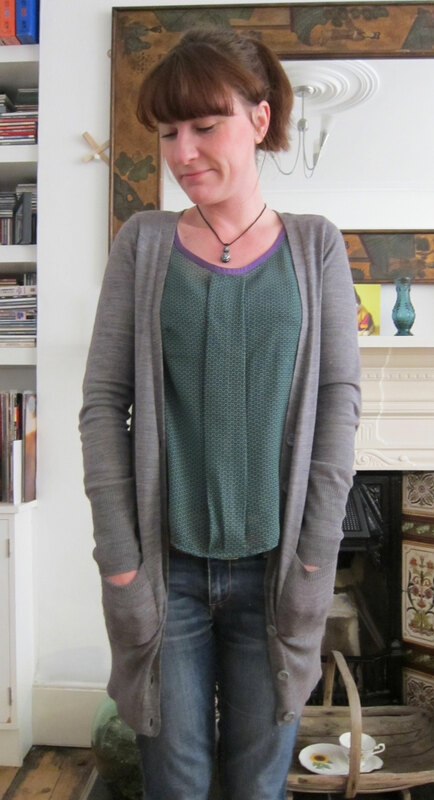 I was so afraid it wouldn’t suit but with a little cardy it’s just right for a grey September Wednesday. 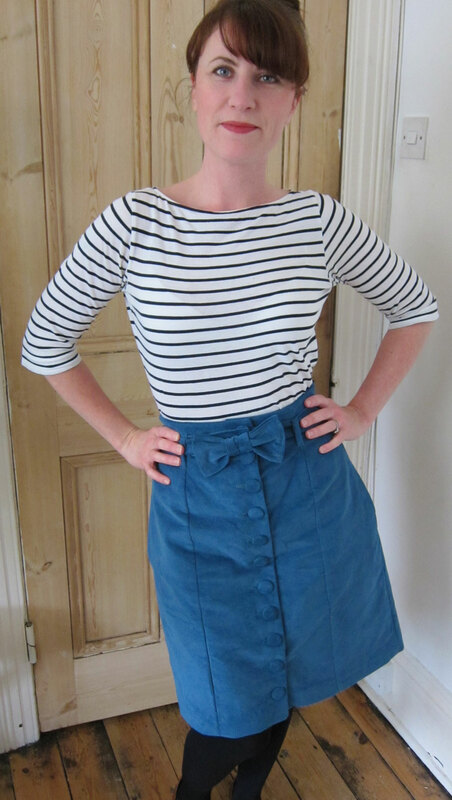 Really pleased with it – it’s warm, super-comfortable and just the right amount of flattering. Wasn’t sure if I would try this pattern again but I think I’m coming round! In other news, I been following Casey’s Circle Skirt Sewalong. I caught up last night, cutting out my skirt and inserting the zipper. But gasp, the waist seems very large, despite following all the directions. I’m hoping Casey will reassure me/come to my rescue when it’s time to sew in the waistband. I’ve made my second Beignet…and I love it. God I love it. 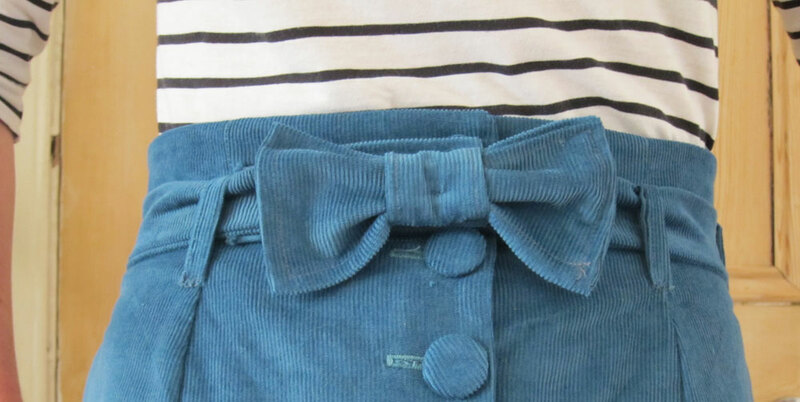 It’s the most gorgeous colour (teal) and material (corduroy). I’m delighted with it. 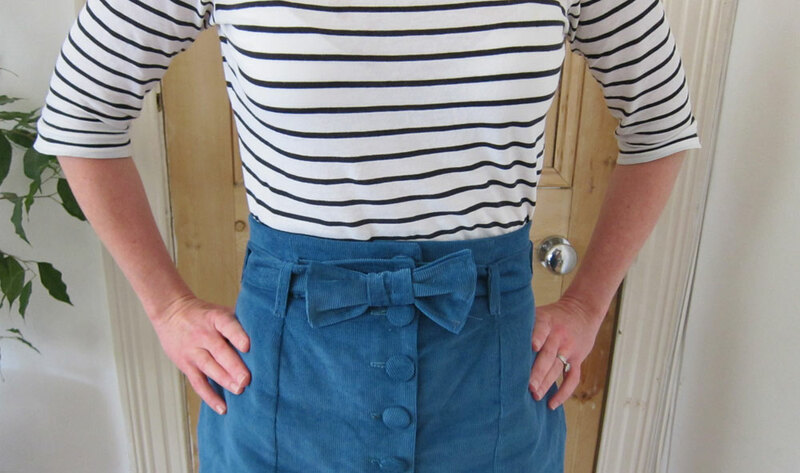 I’ve unashamedly copied both Tilly’s bow belt and a touch of styling on the old stripey top (although truth be told there was nothing else that worked as well anyway with this skirt). With the bow I mostly followed Tilly’s instructions but I decided to make the bow removable just in case I wanted to do something else with the belt like use a buckle or something. So it’s stuck on with some velcro! Hooray for the Beignet. Is there a more accessible or useful pattern out there? I’d love to know but as a beginner sewer this was fairly easy to follow (plus it’s marked as intermediate which makes you feel even better) and it’s so adaptable. Officially am in love with the Beignet. P.S. Just adding a quick para to thank Handmade Jane for her tips on the belt loops. No way would I have been able to create those loops without her clever cheat. Wear again? I feel like this is a bit of cheat, because all I did was take up the dress a couple of inches, and that was about two years ago so I haven’t got it written up on the blog. But I suppose it does qualify… hey ho! 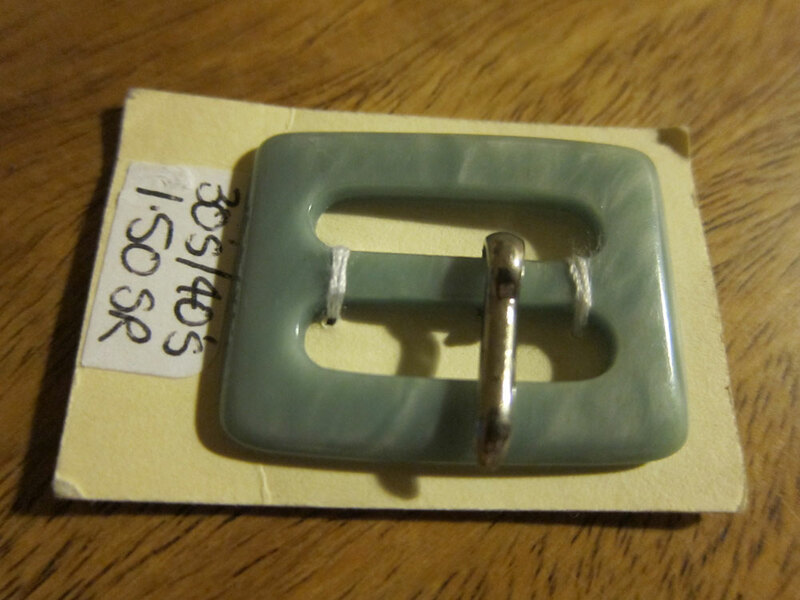 Yes, have worn many times and will wear again. Wear again? Um so basically I had a slip up on Day 14. 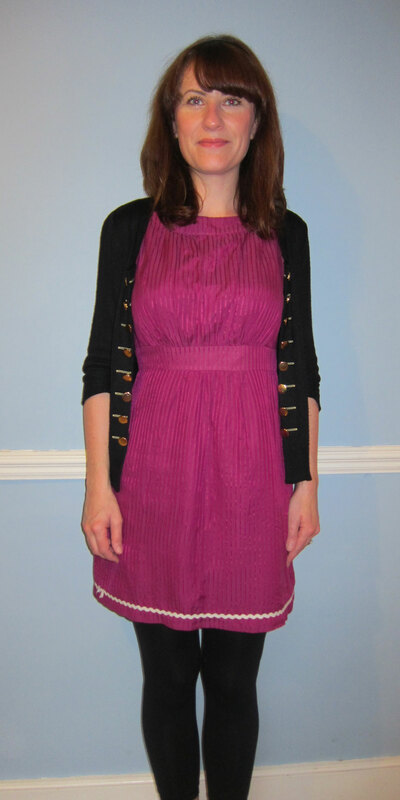 I got dressed as normal and went to ask the husband to take a pic. 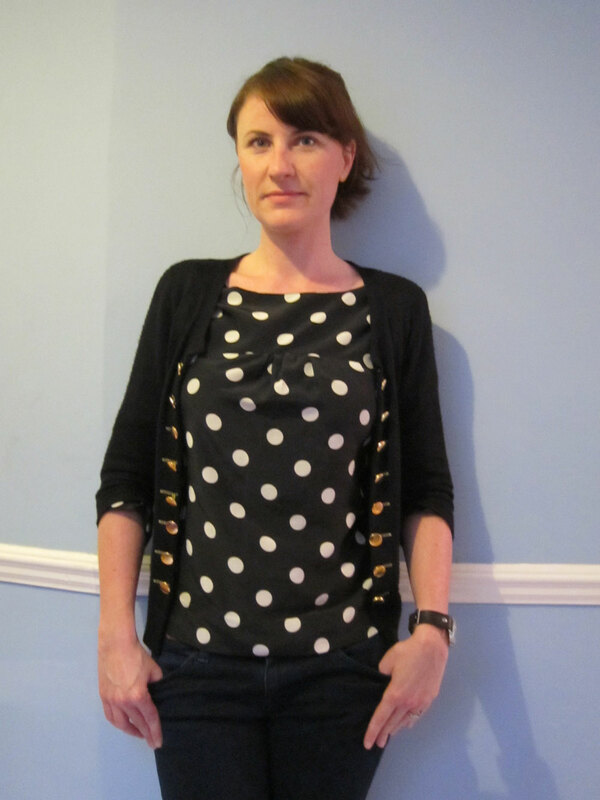 Only then did I realise that the top I was wearing (green Zara polka dot top) was not made by me, but I’d recreated it so many times (three times in fact) I’d gotten confused and thought I had. Has that ever happened to you? 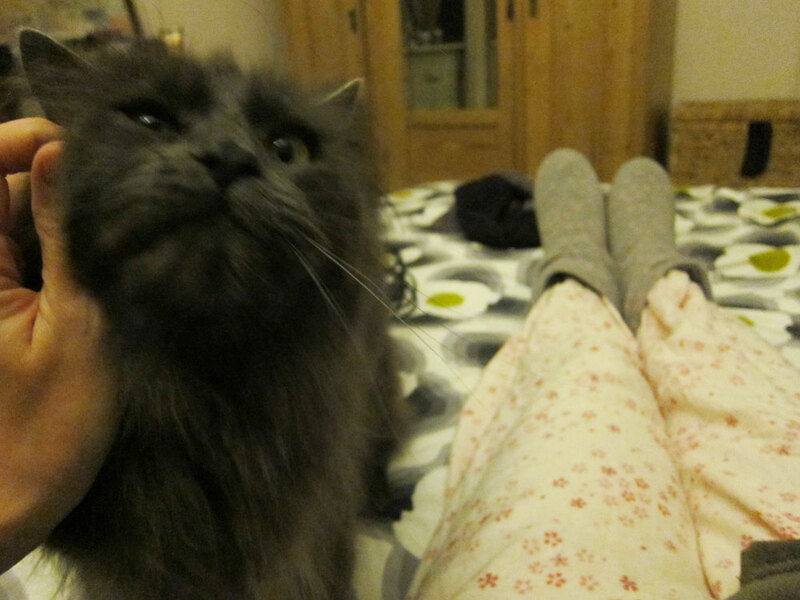 So I had to substitute a pic of the jammies again but to make up for it you also get Keef getting a lovein. Noef noef noef! Wear again? 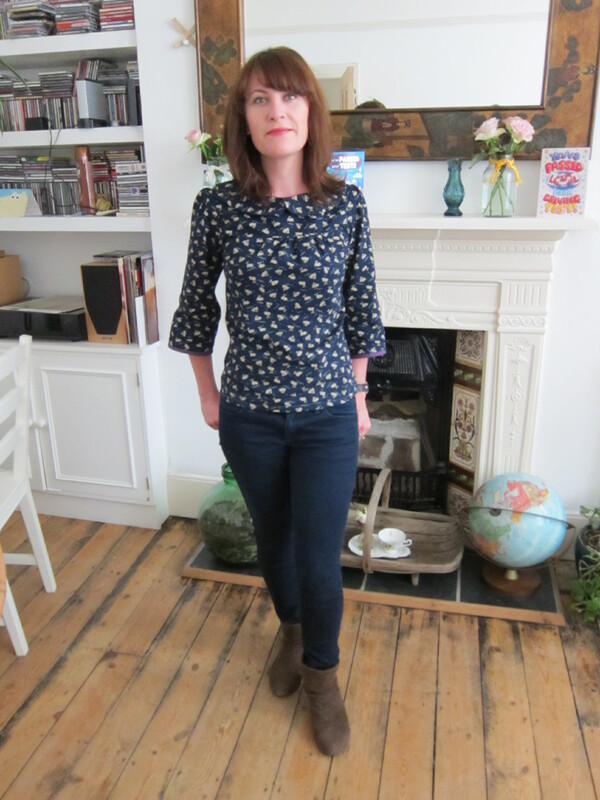 Definitely – I really like this top – it’s sturdier than the other smock tops as it’s made of a thicker cotton and I really love the peter pan collar and bias binding on the sleeves. Wear again? 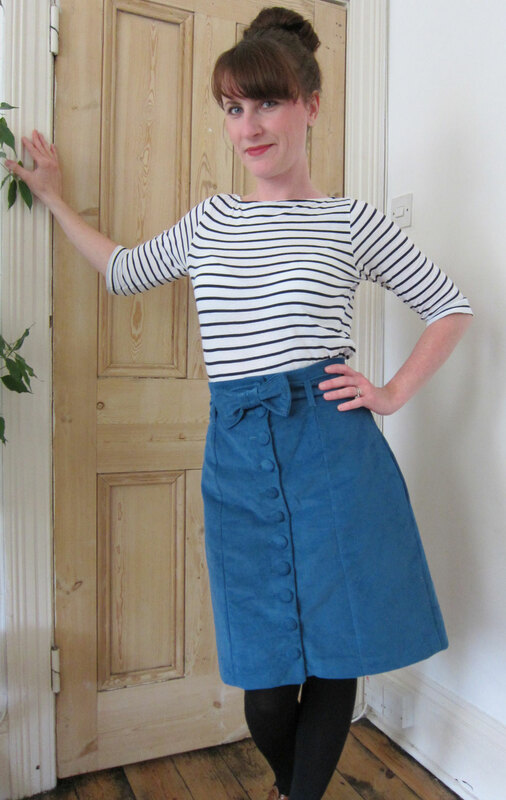 Yay – a whole self-stitched outfit! 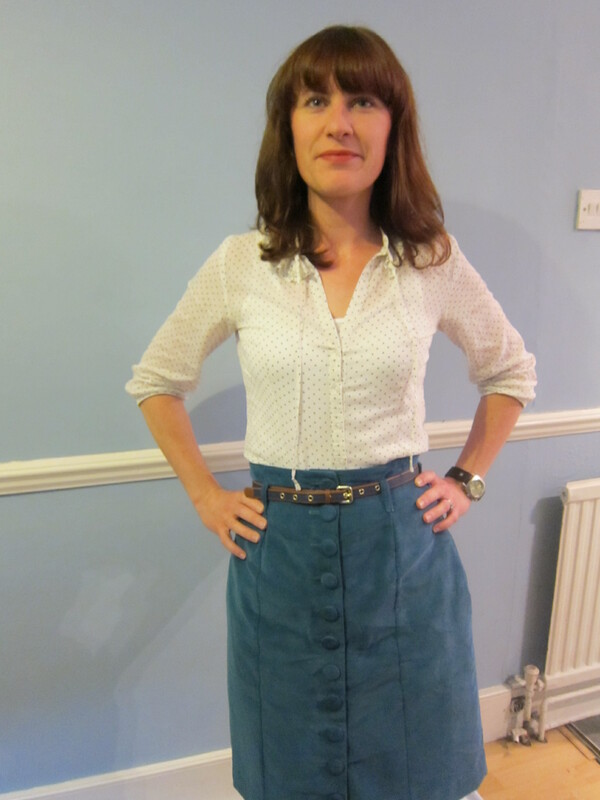 The resewn buttons are staying put for now and the blouse’s popularity shows no sign of abating. This is one of my faves. There are at least three items in my wardrobe that qualify but haven’t been worn yet, for various reasons. 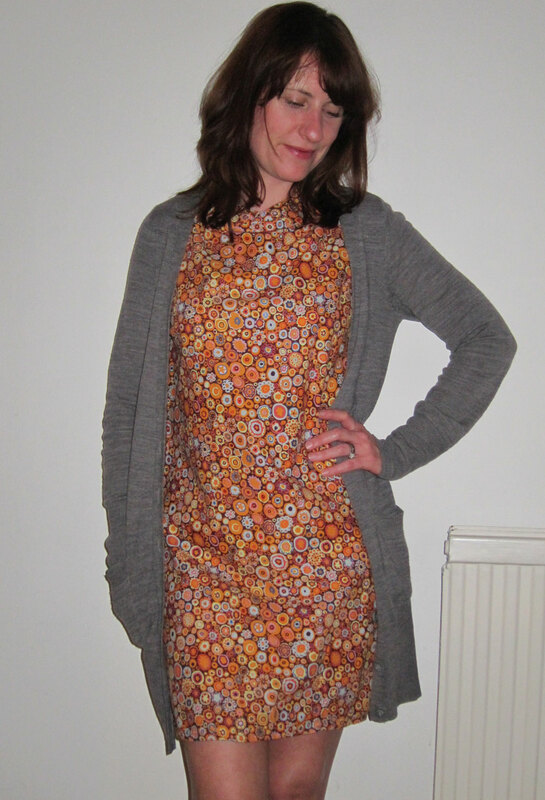 One of them is my slouchy autumn berries jersey dress. One, I feel like it’s a bit too wintry. Two, I feel like it’s a bit too smart to wear to work. Three, I think it has stretched whilst hanging in the wardrobe because it seems a lot bigger than before. But I will get it out this weekend and try it on and hopefully squeeze it in next week.